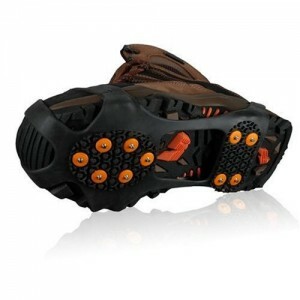 Yak Trax offer traction on snow and ice. These boot chains, or ice cleats for shoes, seem to be the product of choice for the mountain lake resort town residents here in Fawnskin. However, GG has found that there is a whole industry dedicated to the safety of those who must walk over snow and ice. 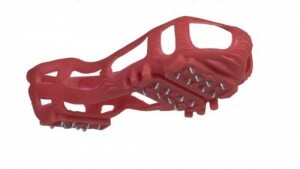 Product names include not only the Yak Trax but also Kahtoola MicroSpikes, StabilIcers, and IceTrekkers. Now this gal has some amazing boots but find that the slick ice can be a challenge–when we have snow and ice that is. We haven’t had too much of a problem with this of late. February and March tend to be heavy snowfall months, so I thought it best to share this information sooner than later. 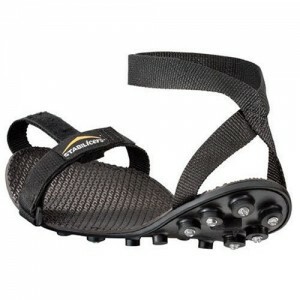 Yak Trax have been in production since 1998 and now come in two different models. The original (Walker) is ideal for anyone ambling about town while the other design (Pro) is more for those adventurers who need something that won’t come off in deep snow or more intense conditions. 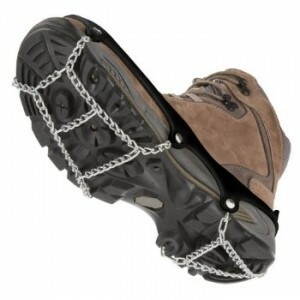 I found a nice selection for you online so you can buy Boot Chains or Ice Cleats for Shoes* from the comfort from your own home. If you have a favorite model or design that you prefer over some of those listed here, why not leave a comment and let us know about it? 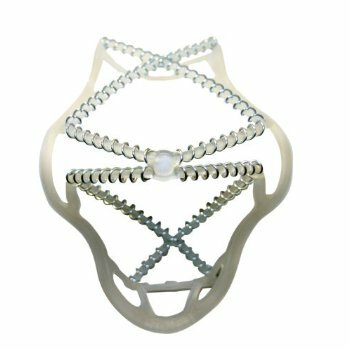 For your enjoyment, here are some pictures of some of the other product options available to you. *Buying online using this link helps support the Fawnskin Flyer. 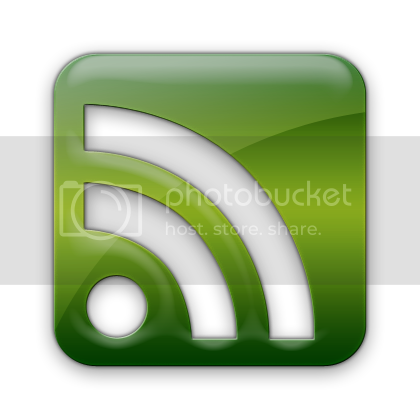 It is an affiliate link which means the FF gets a small commission from purchases you make using it. This entry was posted on Tuesday, January 31st, 2012 and is filed under Mountain Lake Resort, Recommended. WOW!! Buy on line, what a concept. I don’t suppose there are any local merchants in Fawnskin, Big Bear City or Big Bear Lake that carry such a product. But I suppose they would not appreciate the local support. Since you aren’t a paid subscriber, it might be nice for you to realize that if you purchase items with the link from the Fawnskin Flyer, it helps PAY some of the fees associated with running this site. Plus, most of my readers do not live in the local area but off the mountain. BTW since the Fawnskin Flyer gives a lot of free promotion to the local businesses, and have done so for seven years now, it would be nice if they also decided to advertise or promote the flyer. They tend to ask for a lot of free coverage but when it comes to reciprocating–few do. And few have ever said thanks–or even bought me a cup a coffee. So, a big thanks must be given to those readers who pay for an email subscription, tip regularly and to the advertisers who do keep this running because without them, you wouldn’t be reading this. As for GGs salary–well, I am still hoping I get one here one day but so far this has been a seven year community service project. I hope that answers your concerns and feel free to use the link so we get a small commission. Touche. As a PAST business owner, I know the feeling. I always appreciated those that came in wanting a donation, or showed up Halloween to get free candy. Not to be seen until the next year. The overhead, rent, and salaries came mostly from the visitor. I thought it was only my business. Guess I was not alone. Sadly, this is common lament valley wide. Business owners tend to be very generous but the failure to acknowledge or reciprocate is an unfortunate trend. I support a lot of local business which is why I promote many without expectation. My favorite? Well, one business did so well with my review they always give me a 10% discount–which is appreciated. It also works in that I give them more referrals and a mention here and there. That is smart business AND the way I wish it was valley wide.